UPDATE 1: April 19 - Estimates of the size and rotation period have been adjusted since an earlier draft of this press release. UPDATE 2: April 20 - Observations on April 19 show the largest dimension of the body is at least 870 meters, significantly longer than the visible extent seen on April 17. Though designated as potentially hazardous, asteroid 2014 JO25 is not a threat to Earth at this time and safely passed by Earth on April 19 at 4.6 times the distance between the Earth and Moon. Current models predict it will not make a similar close approach to Earth for several hundred years. According to NASA, the next known close approach by an object of similar size is in August 2027 by asteroid 1999 AN10, which is estimated to be more than 700 m (2300 ft) in diameter. 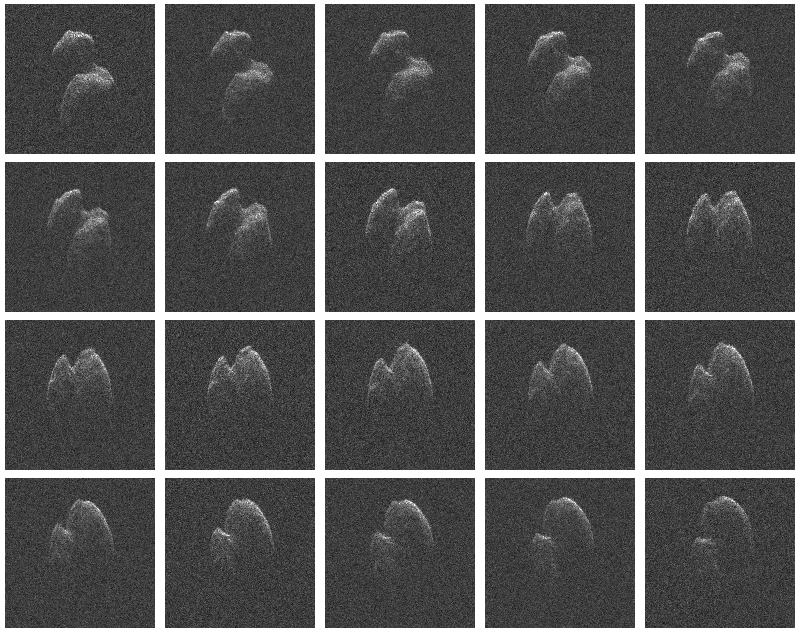 Mosiac of delay-Doppler images taken using the Arecibo Planetary Radar system on April 17, 2017.